You might remember that I recently broke my trusty notebook computer. 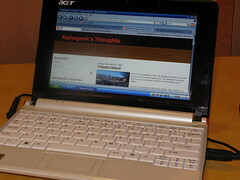 After Mrs. Alphageek and a camera, my old notebook pc was my most trusted traveling companion. It quickly became evident that I needed another pc and I needed the new pc quickly. I happened to be in Wal-Mart and decided to glance at the notebook computers. I now think computing power in a notebook is not very important. After all, to write a blog, upload some pictures and update a facebook account does not really require much computing power at all. I fell in love with a teeny weeny computer that Wally world had. It was made by Acer and cost $350. Mrs. Alphageek approved the purchase and we went to buy one. Unfortunately, Wally world was sold out. We asked if another store had one and we were directed to Salem. We stopped on the way home and I made the purchase. I have been using this pc several weeks and I am favorably impressed. It has a great, but somewhat smallish display, several usb ports and a built in slot for camera memory, at least for one of my cameras. The other camera uses compact flash which still requires and external reader. The pc comes with Windows XP Home, but other models come with linux. If you don't know what linux is, never mind because that is a geek thing. The pc comes with bunch of crapware software, which I have removed and replace with reliable freeware. It also has a built in camera. I guess I could use that for chatting, but nobody ever chats with me using text, so video is probably asking for too much. The pc has proven to be quite reliable so far. If you need a small pc, this model is looking like a good purchase. I give it a conditional approval. For permanent approval, it will take about six months. As always, feel free to use the post function to talk back. For you facebook folks, it would be ok to post something here too. I really need the traffic on my site.